I have played some, "Castlevania," games but am by no means a huge fan of the games. I also read very little about the Netflix television show and only knew a writer who makes lots of great stuff--Warren Ellis--wrote the story. Once this came out I heard a lot of good things so I thought I would give this short 4-episode season a viewing. You can almost tell this was originally going to be a movie and was kind of split into television episodes, plus once it seems to really get going this bite-sized season ends, but when I'm complaining something was too short or offered too little that usually is a good sign I liked what I got--and I did! 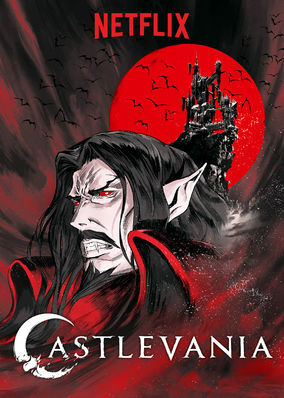 "Castlevania," is cleverly written by the aforementioned Warren Ellis and produced by a number of folk including Adi Shankar. It has gorgeous anime-ish visuals, and otherwise is a fantastic time! I was impressed by how the first episode doesn't even introduce our main protagonist (Simon Belmont) until right towards the episode's end, instead setting-up Dracula as the big-bad and actually making him look quite sympathetic and almost understandable. Yes, he's trying to destroy the world, but humans have really done some terrible stuff to him. The rest of the series shows as Belmont helps a town deal with invading monsters (summoned by an angry Dracula to destroy the countryside) and meets some other folk who then all agree to go and fight Dracula...right as the season then immediately ends. It makes all four episodes almost feel like one big prologue, which is a little perturbing, but what we got was stellar so now we just have to patiently wait for the already-announced 2nd season which will feature eight episodes. 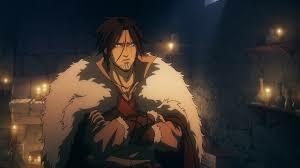 This short first season of, "Castlevania," is almost more of a teasing taste of what I imagine is more goodness to come, but of what is supplied by, "Castlevania," I found to be smart, fun, and all-around great entertainment. I went from having minimal interest in this show to now being a big fan--I am already eager for the next season!